Railway Recruitment Board has released Notification for recruitment of Junior Engineer (JE) 2019 Exam. 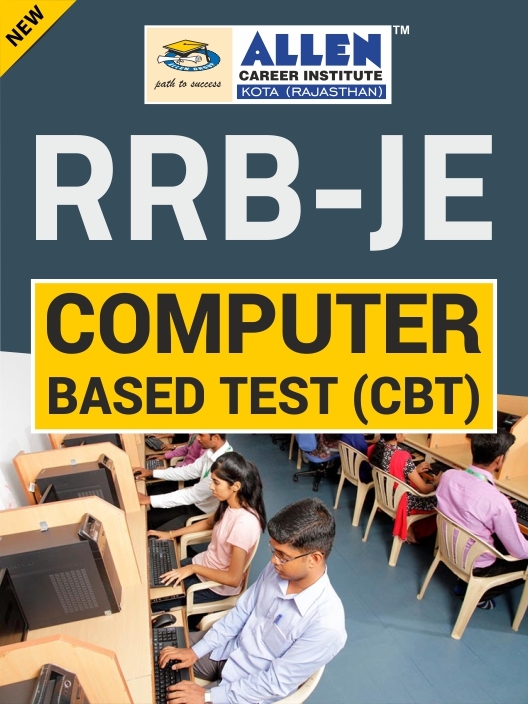 The complete process of RRB JE 2019 recruitment comprises 1st stage Computer Based Test (CBT), 2nd stage CBT, and Document Verification / Medical Examination as applicable. RRB Junior Engineer Exam is a wonderful opportunity for you to join the Railway Recruitment Board and turn your dreams into reality. To ace RRB JE 2019 Exam, it is necessary to know the actual Exam pattern in real time exam settings. This will help you to prepare prudently for RRB JE 2019 Exam. ALLEN's RRB JE mock CBT mock has been prepared by our subject experts in such a way that aspirants get a clear understanding of the level of actual exam and help you become master of speed and accuracy which will, in turn, help you during the actual RRB JE 2019 exam to avoid answering any question wrong. It also assists you to analyze your performance and know your weak and strong areas. Kick start your preparation now with ALLEN's RRB JE 2019 Computer Based Test 1, gain an edge and outperform in the actual exam. Simulation of Actual Exam: Students will get similar interface for grand mock RRB-JE CBT exam to familiarize them with the computer based testing tools and the type of questions they are likely to face in actual entrance examinations. Full Syllabus Test: It will cover complete syllabus of RRB-JE and the set of questions will follow the actual exam pattern. Also, fully colored image based questions similar to RRB-JE exam. In-depth Self Assessment: Student will get a multidimensional performance analysis subject-wise/topic-wise/question-wise, which has been designed to bring forth the learning gaps and guiding student at a time. Ranking & Analysis on national level: Get All India Rank on RRB-JE mock exam and comparative analysis with topper that helps students to know their preparation and identify where they are lagging behind. Eliminate Exam Fear Factor: RRB-JE aspirants can easily avoid their fear factor by giving exam in similar examination settings before appearing to the RRB-JE 2019. Time Management: Student will get a time management report that will help them not only in mastering the art of Time Management by pointing out their most and least time consuming areas, but also helps to improve the overall speed of answering questions in an exam like environment. Boost Performance: These test papers provide a sound examination temperament which not only enhance the student's scoring ability and test taking capability, also enhances the confidence. Fully Furnished Test Center: Students are able to take their examination at conveniently located test centers well furnished with computers. You may want to take Second Attempt of previously unattempted questions in this test. This will help you improve your question selection in real exam.